Home » Trending Now » Why is Toilet Water Coffee trending? 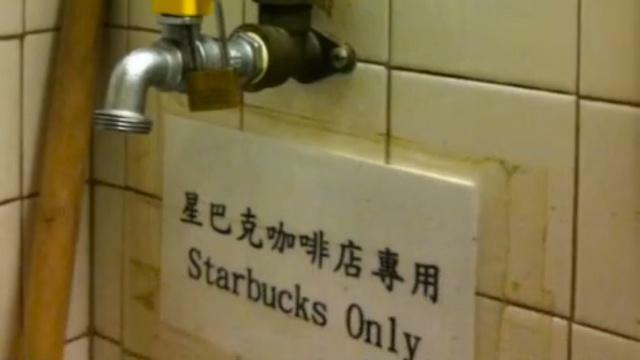 The water supply in one Hong Kong Starbucks comes from a bathroom sink faucet, which is a little bit of a stretch to call it toilet water since they’re not scooping coffee pots into the actual toilets. More specifically, the establishment in question is located at the famous Bank of China Tower. A local newspaper took photographs inside the Starbucks and snapped a picture of the faucet used by Starbucks employees to make coffee with, and that faucet has a “Starbucks Only” sign under it. The faucet is just a few feet away from a urinal. 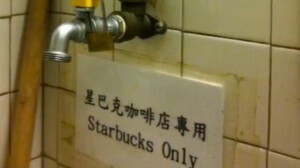 The “Starbucks Only” water faucet. One customer has reached out to express his opinion on the matter: ”Totally disappointed! The initial decision by Starbucks to use water from toilet is a clear sign of your company’s vision and the level of (dis)respect your company has for the health and mind of your customers.I’m now really worried when I purchase coffee from Starbucks. Who knows which other stores are using the similar practice! Scary! !” In defense, Starbucks spokesperson Wendy Pang has said, “There is no direct water supply to that particular store, that’s why we need to obtain the drinking water from the nearest source in the building.” The Hong Kong Starbucks under heat runs the water through a filter system in order to abide to local and World Health Organization standards.